I hadn’t been out to Havarock for more than a month. Today, I have a meditation exercise that I want to try. It is laying down, arms out, legs spread, flat on my back, for seven minutes. It is called “repose”. As I begin the walk, I notice many things, large and small, are out of place. A terrific wind had come through the day before with a thunderstorm. The effect was like a hurricane. There has been a series of frequent rains and storms. This is the Monsoon season. As I continue out the trail, it is evident that rain has come. There is barely a discernable trail, now. The soil is washed like new. 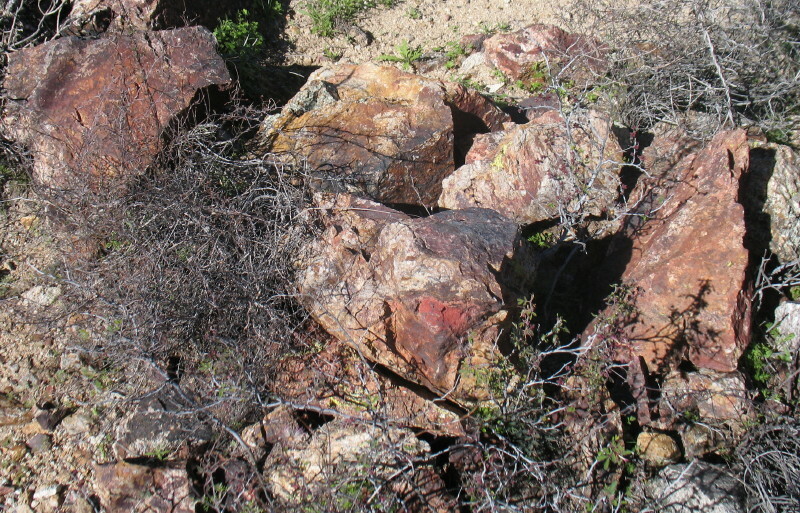 The previously broom swept parts of the trail have new pebbles and rocks, which are exposed by the erosion. Everything has new green leaves and growth. The Cholla are growing into the path threatening my shoulders with their balls of thorns. Had I not been familiar with my trail, I would not recognize it as a trail at all. I have noticed, for some reason, that sounds are louder. A cottontail bunny sounds heavier scurrying into the nearby bushes. Could it be the fat of new growth? I haven’t gone very far, just midway in the shallow little valley between the hills, but there is a louder noise behind a bush and a mesquite tree at about the 2:00 direction. Suddenly, two large mule deer jump out and bounce about ten yards away from me and then stop. They both take a stance, toned and athletic looking. They are seemingly curious. Their heads are turned my way in that still deer way. Those huge ears are erect. I stand still, naked but for shoes and I observe as I turn. Maybe 80, maybe 100 feet away they have become as 12:00. I stare, they don’t move. I’m concerned to move and spook them. It is as though they are not feeling threatened, like they just don’t know what to think about this alien naked being. I suppose that we are all taking a “wait and see what happens” tactic. I look at my feet and see a piece of newly exposed ancient Indian pottery chard. I squat to pick it up, still watching the two watchers. One moves a bit, still gazing intently. I hold the chard. It is as if I’m communicating with those before, and these deer in some way. The chards are found everywhere around here. It is evident that someone lived on this land hundreds of years before me. So did these deer. We share. I have a sense of naked and primal. That, now ancient period was probably the last time a deer and an unclothed human being interacted around here. Two or three minutes have gone by; I drop the chard. I raise my hands and send oneness energy to these two animals. Like many other animals have done, one responds by dropping its head relaxed and starts to eat. Then, as if shaking something off, it looks back at me. The other begins to calmly walk away up the hill, the friend begins to follow. When they are perhaps 30 more feet away acting comfortable, I decide to take the trail were it goes at out at an 11:00 direction. This herd has always been seven to nine, over the years. I feel concern for the others. I ponder where they might be. As I slowly move forward down the trail. I jump, startled. 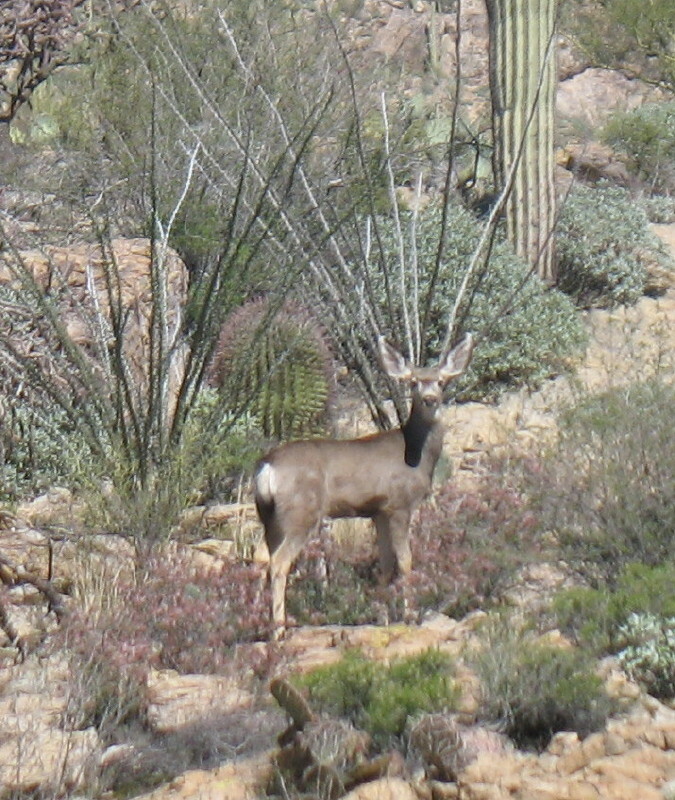 A large buck is in the mesquite not twenty feet to my left! It bounds away. It had been waiting me out, so close, all of this time. The other two are walking up the hill. Very quickly they are all gone. Five minutes alone with them and so close, interacting, I’m pleased. I’ll bother them no more, today. I continue meandering to Havarock. Climbing onto it, I realize that the sun has baked it hot. My bare skin may be shocked, but I quickly get used to a soothing warm rock surface. I also realize, that this rock is not perfectly flat enough to sustain my new meditation experiment. I sit for a time, but know that I must return home to accomplish the exercise. I have walked through the field of beautiful deep burgundy and purple rocks. This time I decide to take two home. Maybe I’ll take two each visit. They will look distinctive in a building project. It is good exercise to walk with one of these weights in each hand. With distance and time, they become heavier and heavier. I move them into various positions until the different sets of muscles get a workout. I notice how they change my balance, how weight shifts, as I negotiate the various turns and body twists that are required to walk this trail through the encroaching desert, when I’m bare all over. The exercise is also a meditation in the mindful awareness of all senses. As I return and put them in a storage place and then admire their form and distinction, a storm approaches with the first drops of rain. My body tells me all about it. Next Week: A story about intuition and spontaneity. Sometimes one thing leads to another.